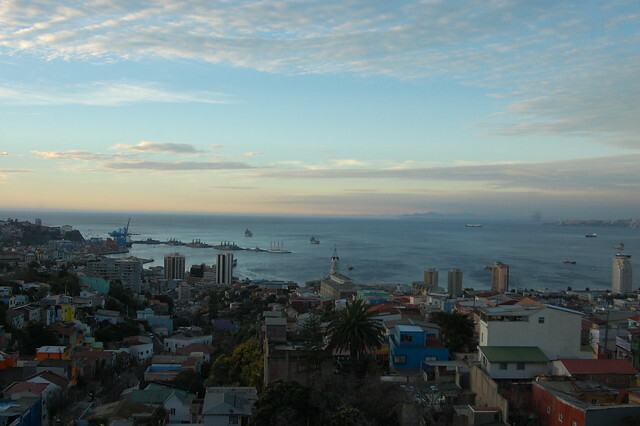 After spending an afternoon enjoying the sun and beaches of Viña del Mar, my Chilean friend, Francisca, and I headed to nearby Valparaíso. 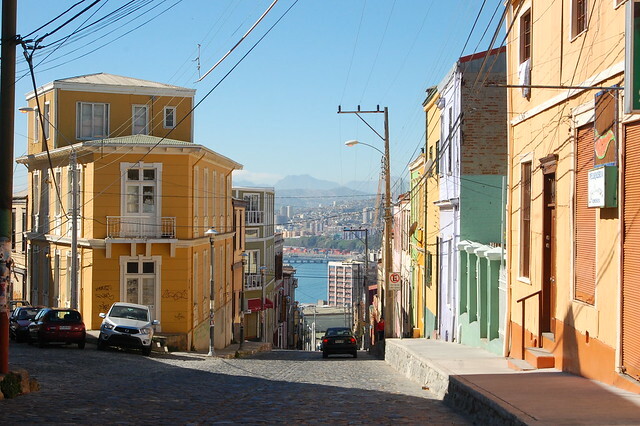 Over the years, I’d heard bits and pieces about Valparaíso, Chile, namely that it was a lovely city with a lot of character located on the Pacific, and I was ready to experience it for myself. 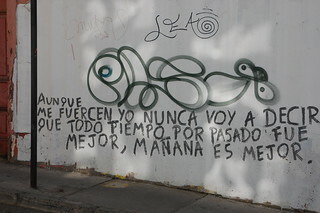 Our first stop was La Sebastiana, Pablo Neruda’s house in Valparaíso. 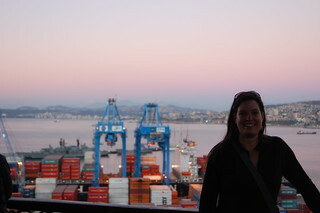 Fran thought it would be fun to continue our tour of the private life of Chile’s most famous poet. 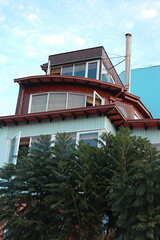 Although you are not allowed to take photos inside the house, the windows of the quirky three-story house afforded an amazing view of sunset falling over Valparaíso. Based on the clouds in the sky, I realized that the evening’s sunset was going to be a special one, so we found a good vantage point to take in the sunset. We were not disappointed. 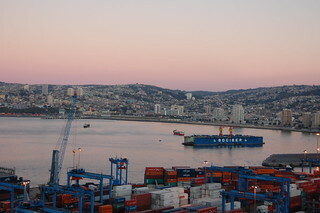 The setting sun illuminated Valparaíso’s houses perched on the surrounding hills and painted the clouds pretty shades of pink and purple. 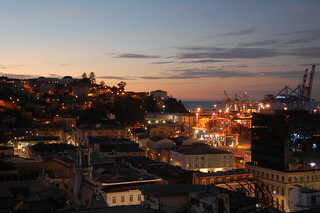 How could you not fall in love at first sight with a colorful seaside city like this? 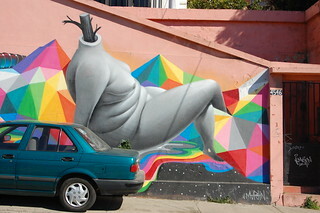 After watching the sunset, we decided to explore some of the galleries scattered about Valparaíso. 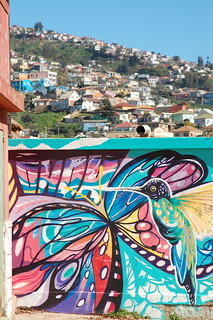 Valpo (the city’s nickname) is famous for its bohemian atmosphere and support of the visual arts, including the murals and graffiti art that decorate nearly every available surface in the city. We lingered over some screenprinted representations of the distinctive Valpo hills, and I ended up buying a handpainted canvas directly from the artist. 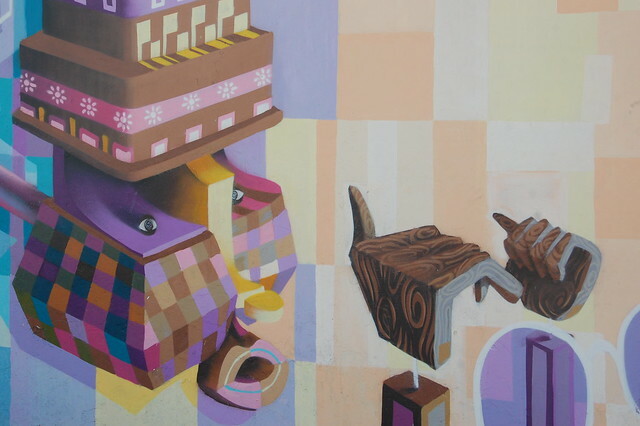 I loved the way that all of the art celebrated the special characteristics of the city, like its small houses, ascensores, and churches perched at the top of the hills. 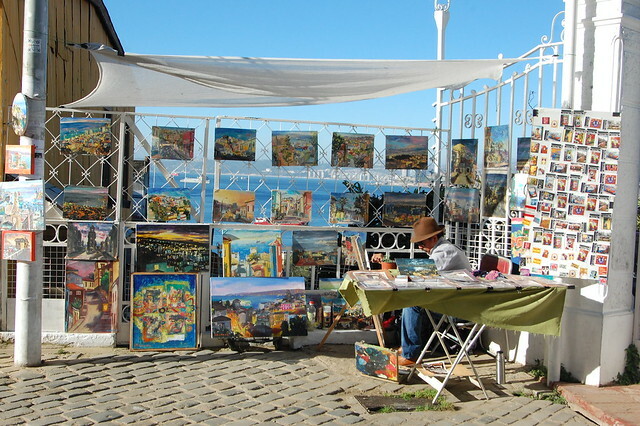 As we were leaving Valparaíso, we both lamented that we hadn’t been there long enough for me to really take in the full character of this artsy city. 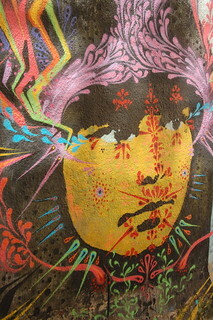 We hadn’t even been able to wander around in search of interesting street art! We quickly decided to spend another night at Fran’s parents’ house in Curacaví and return early the next day to continue exploring. 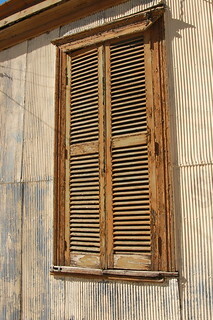 Luckily, we were blessed with another gorgeous sunny day, perfect for walking through the streets of Valparaíso. 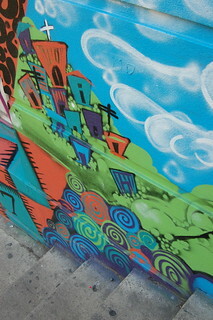 I was amazed at the talent evident in the colorful murals and how they were often adapted to match their surroundings. I was also surprised at how much the city felt like a smaller, more compact version of San Francisco, with its steep cobblestone streets. We started our day at Cerro Alegre, then headed to nearby Cerro Concepción, two of the most touristic hills of the city (there are over 40!). 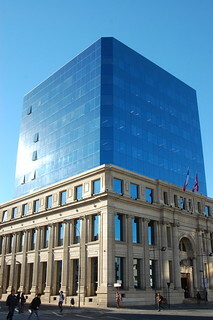 These photos were shot in both locations as they are within walking distance of each other. The photographer in me was overwhelmed by all the eye candy. 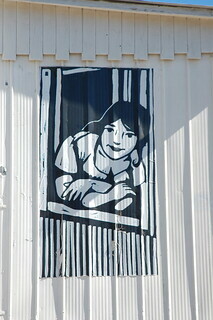 Even the buildings that weren’t decorated with murals had character! 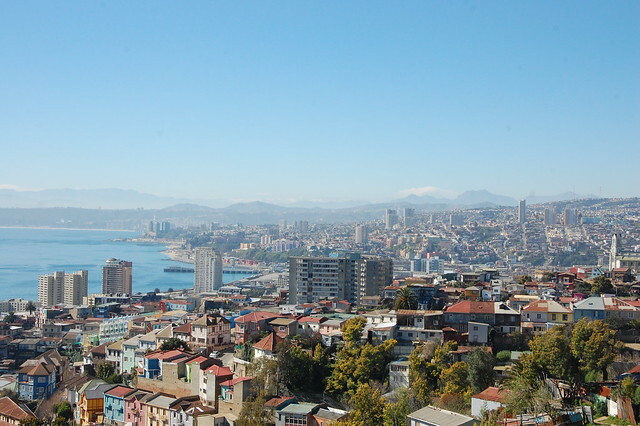 Since it was a clear day with a brilliant blue sky, I really wanted to get a nice shot of Valparaíso surrounded by the cordillera with its snow-capped peaks showing in the distance. We walked for a little while to a stretch of sidewalk that was unobscured by houses, and were rewarded with this awesome view. 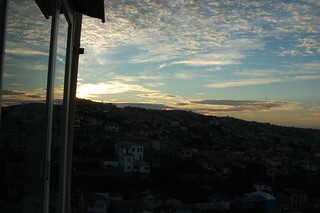 From the top of this hill, you could see the tall industrial buildings and the colorful residential buildings. 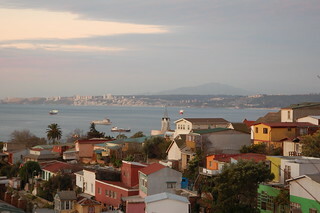 Walking through the streets of Cerros Alegre and Concepción, Valparaíso seemed small, but the city clearly sprawled far off into the distance. 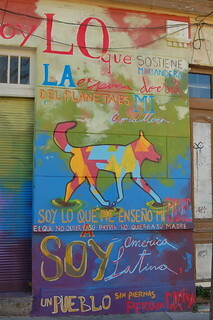 As a student of Latin American culture, I was particularly drawn to the art that celebrated Chilean and Latin American identity. 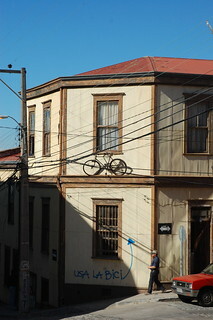 Of course, I also appreciated this reference to biking culture, going strong throughout Chile! 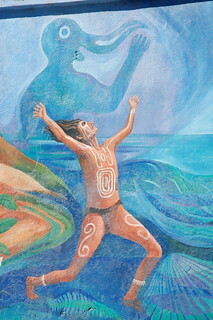 This giant mural illustrated Chile’s many landscapes and cultures, including that of Easter Island, as you see above. 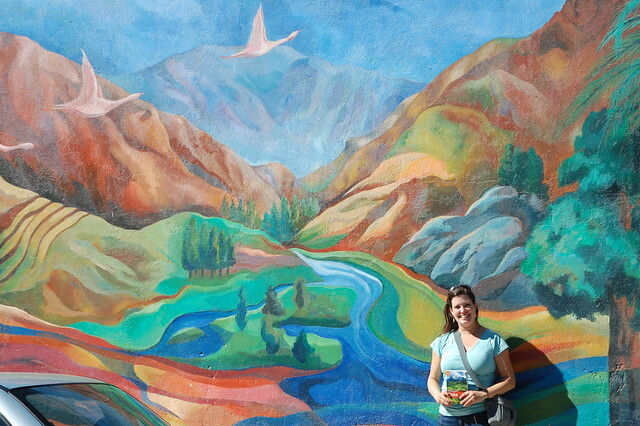 By this point, I was completely enchanted by Chile, so I couldn’t resist posing with my guidebook and commemorating my visit to this amazing country! 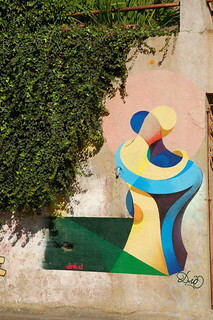 I am always impressed by artists who can make art seem 3-D, as in this colorful mural. After spending a few hours wandering through the streets, Fran suggested we have lunch at Hotel Brighton, one of the best-known restaurants in the city. 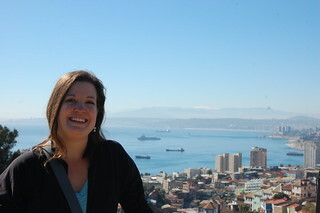 Built into the hill, it has amazing views of the water, the surrounding city, and the mountains. 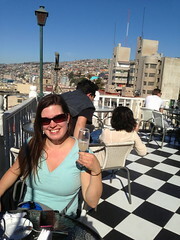 Above the cafe/bar is an exclusive hotel with incomparable views. 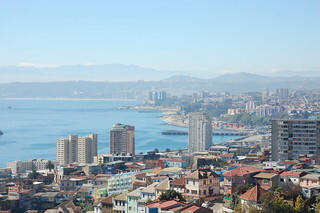 After eating lunch and sampling a pisco sour, we poked around in more of the cute shops lining the streets of Cerro Concepción and admired some more artwork, and then decided to head down to the business district at sea level, below. 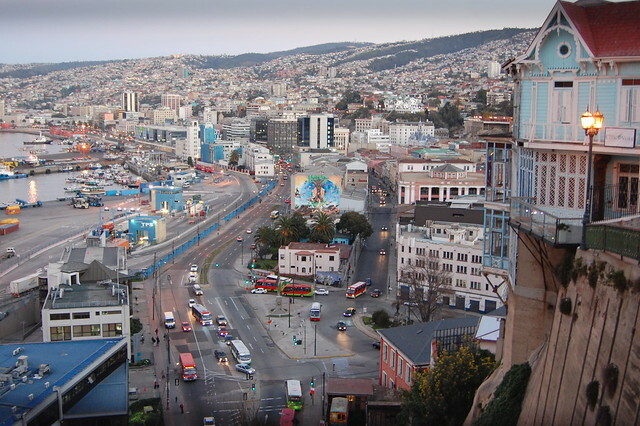 Valparaíso is famous for the ascensores, or funiculars, that provide cheap, easy transportation between the business district below and the residential hills above. 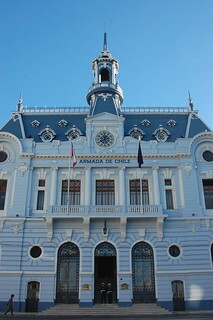 These ascensores are more than 100 years old and represent the working class past of this port city. 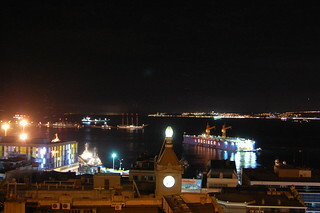 In the past, Valparaíso had more then 20 ascensores, but now only seven are currently in use. Riding these rickety wooden train cars is a full body experience with a visual reward. 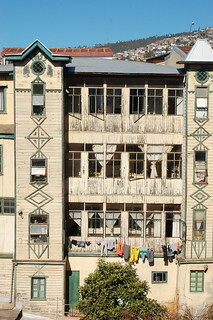 Stepping off the ascensor and into the business district of Valparaíso is like entering a completely different city. Suddenly, you’re surrounded by people walking around at a brisk pace and buses, trolleys, and cars passing by on crowded streets. The buildings around the main plaza are impressive, particularly the two pictured above! 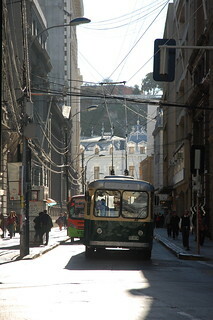 After wandering around for a bit in the busy downtown, we took another ascensor to Cerro Artillería. (We visited in August 2013, but, unfortunately, this picturesque ascensor is currently under construction and is no longer operational.) 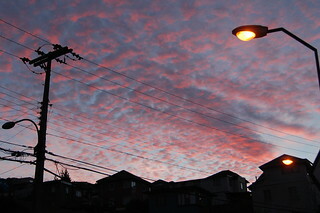 On Cerro Artillería, the ambiance is a little different. Instead of being geared towards the more affluent tourists who pass through Cerros Alegre and Concepción, the amenities seemed aimed at locals, which made browsing and lingering over the views much more comfortable for me. 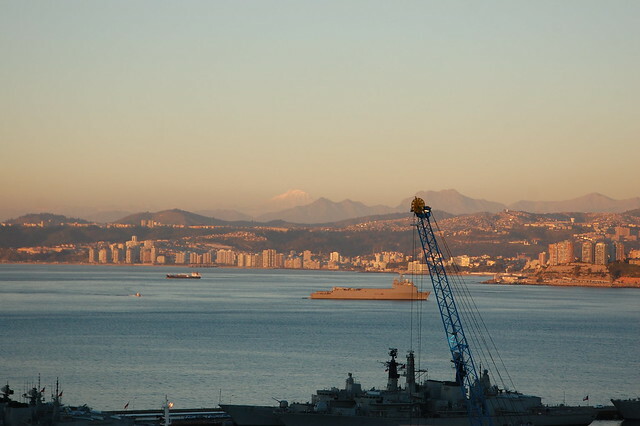 When you leave the ascensor, you immediately see the giant building which used to house the Escuela Naval (Navy School) and has since been turned into the navy’s museum. 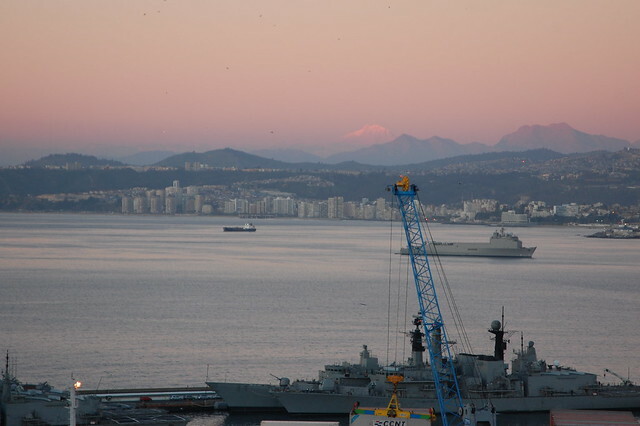 You can also walk along the Paseo Mirador 21 de Mayo, which affords great views of the cordillera in the distance and overlooks the constant movement and noise of boats being loaded with shipping containers in the port below. We spent some time chatting with a few local artesanas (artisan women) who were selling their jewelry nearby. I still get compliments on the jewelry I purchased from them! Back on Cerro Alegre, we decided to stop in at an adorable small cafe called Mercadito Alegre. 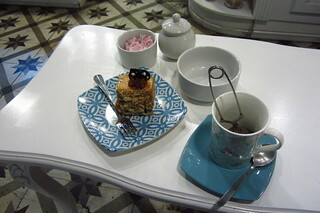 I was excited to find loose-leaf tea to warm me up, and couldn’t resist a sweet treat. 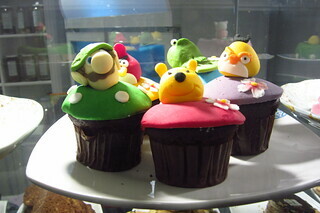 I also loved the adorably decorated cupcakes, including various characters from the World of Nintendo and Winnie the Pooh. Spend as much time in this fun city as possible! We were only there for a day and a half and I could have easily stayed for a week exploring the vibrant streets and poking my head into all the shops and restaurants in the area. 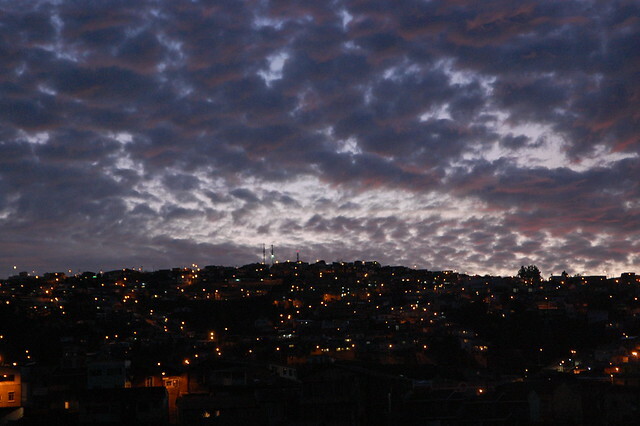 To get a real sense of the city, you should venture beyond Cerro Alegre and Cerro Concepción and visit some of other hills, like Cerro Artillería. 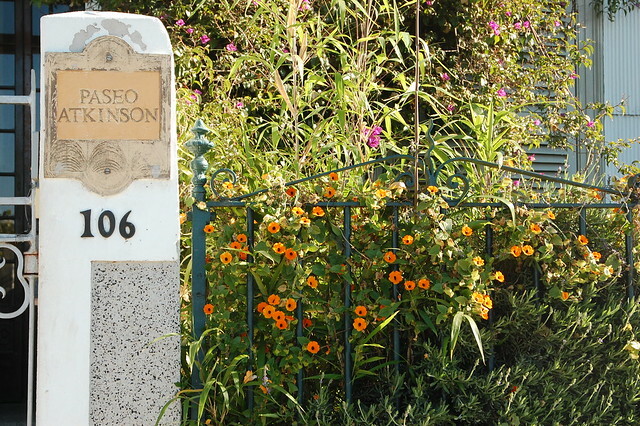 Make sure to ride at least one of the famous ascensores that used to be the primary mode of transportation between the business district and the residential areas. A ride costs $500CLP (about $1 USD). Stop in to have a warm drink or a snack at Mercadito Alegre! This was the cutest cafe I visited in Chile. 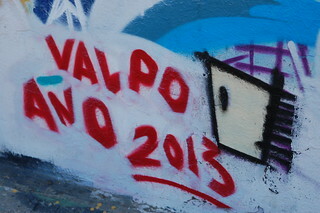 Although I did not have a chance to explore them on my quick visit, Valparaíso is also known for its many churches. 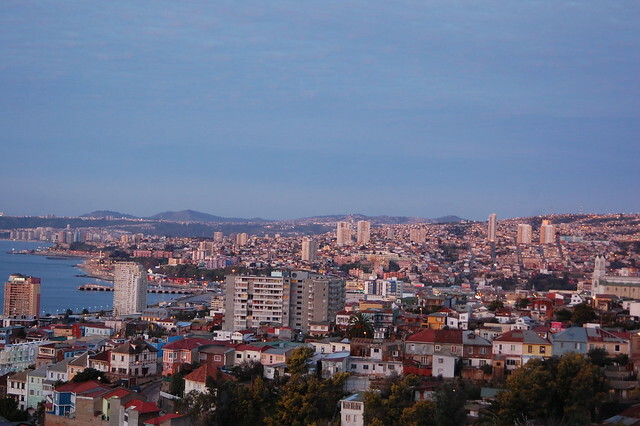 Check out this comprehensive list of things to do and places to stay in Valparaíso! 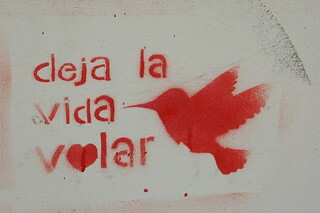 Big News: I'm Moving to Chile!